Yogyakarta – Tuesday, August 7, 2018, the Doctoral Program of the Faculty of Economics and Business, Gadjah Mada University held a public defense of Dwita Darmawati, a doctoral student in the Study Program of Management and a lecturer in the Department of Management, Faculty of Economics and Business, Jenderal Soedirman University, Purwokerto. 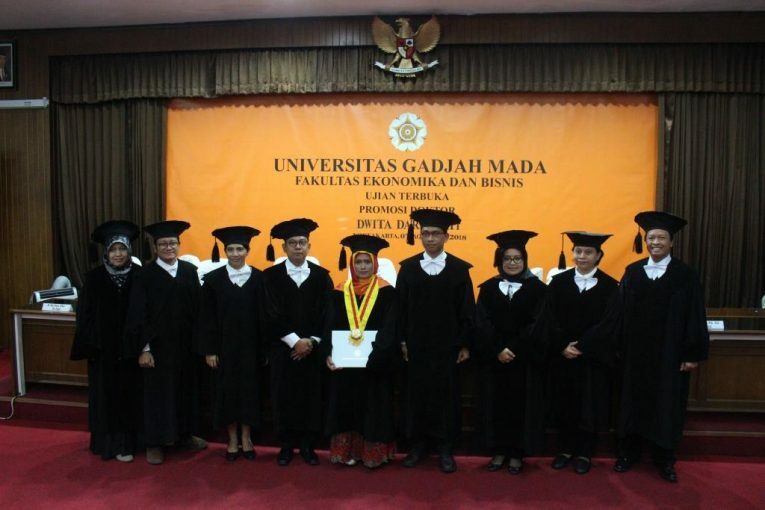 Dwita Darmawati officially holds the 4097th doctorate at Gadjah Mada University and the 253rd doctorate at the Faculty of Economics and Business. Public defense was lead by C. Budi Santoso, M. Bus., Ph.D. as a chairman committee, and attended by the promoter team, Amin Wibowo, M.B.A., Ph.D. as a promoter, Sari Sitalaksmi, M.Mgt., Ph.D. and Ely Susanto, M.B.A., Ph.D. as co-promoters and the other committee members, Nurul Indarti, Sivilokonom, Cand, Merc., Ph.D., Wisnu Prajogo, M.B.A., Ph.D., RR. Tur Nastiti, M.Si., Ph.D. and Dr. Reni Rosari. M.B.A. Dwita Darmawati successfully completed her dissertation which entitled “Conflict Asymmetry: The Role of Composition of Group Personality and Collaborative Management of Conflict in Group Creativity” which passed with a satisfying predicate. On her dissertation, she focused to examine the effect of group personality composition on task group asymmetry, the negative effect of task conflict asymmetry on group creativity, and the moderating role of collaborative conflict management on the effect of task conflict asymmetry on group creativity. The results of this study viewed three findings. First, the personality composition of neuroticism groups has a positive influence on the task conflict asymmetry. Second, task conflict asymmetry has a positive effect on group creativity. Third, collaborative conflict management moderates (weakens) the positive influence of task conflict asymmetry on group creativity.